With the recent Mailchimp and Shopify split, many ecommerce marketers have been left wondering what to do for their email marketing strategies. 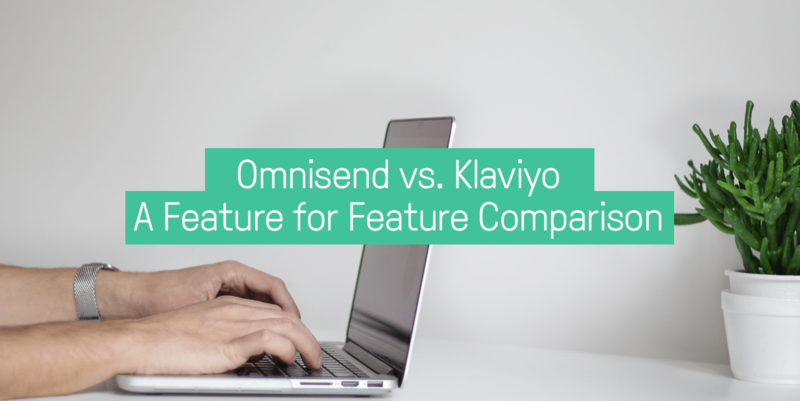 If there are two names that come up most often when talking about Mailchimp alternatives, it’s Klaviyo and Omnisend. There’s been quite a bit of debate from customers using both tools over which is better, and today, we’ve got your answer. We’re going to go through a feature by feature comparison. Omnisend vs Klaviyo: which is the better tool for your ecommerce email marketing strategy? Who is Each Platform Built For? Which Platform Does Email Marketing Better? Which Tool Builds the Best Subscriber List? Which Tool Offers the Best Segmentation? Which Tool Offers the Best Automation Workflows? How Does Pricing Measure Up? Omnisend vs Klaviyo: Who Is Each Platform Built for? Both platforms position themselves as specifically built for ecommerce marketing. Both Omnisend and Klaviyo integrate and play nice with the biggest ecommerce platforms, like Shopify, Shopify Plus, BigCommerce, Magento, and WooCommerce. With that said, Omnisend integrates more easily with Prestashop, Drupal Commerce, and Opencart. Both Klaviyo and Omnisend offer an impressive amount of third party integrations, ranging from loyalty and rewards programs, to shipping tracking providers, and checkout services. So far, both tools seem pretty similar and stack up evenly against one another. Now let’s dive a bit deeper and take a look at each aspect of the battle Omnisend vs. Klaviyo. Both Omnisend and Klaviyo have visual email composers allowing you to drag and drop elements into your email campaign. Both offer plenty of templates to get your creative juices flowing. Let’s take a look at each email builder and compare them. In Klaviyo’s email builder, you can add basic customizable text, images, columbs, buttons, and tables. Outside of that, you can’t add anything too flashy. 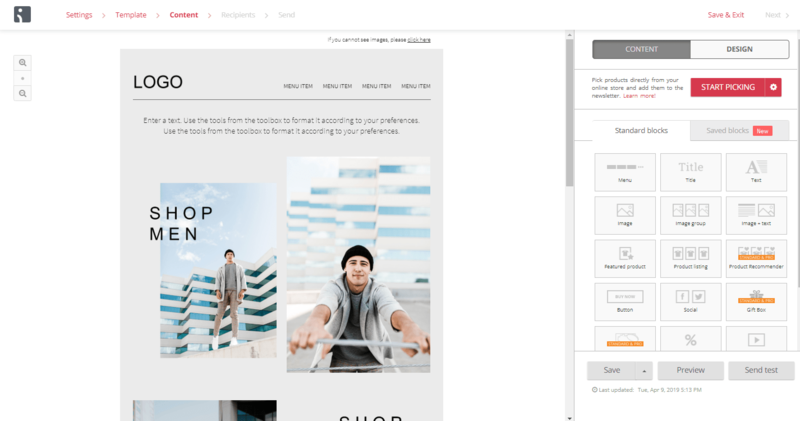 It’s definitely possible to create lovely emails using Klaviyo’s builder, but there are quite a few ecommerce-related things you’ll have to do manually. You can, however, add in products directly from your store which is a timesaver. In Omnisend’s email builder, you have a lot more options for customization. You might start off with less templates than Klaviyo, but you have a lot more to work with in terms of the content you can create. For example, Omnisend also offers the Product Picker feature that allows you to pull products from your store directly into your campaign. You can also integrate with Nosto for smart product recommendations straight to your campaigns, making your products even more personalized for your customers. Also, Omnisend offers more ecommerce-friendly features, like discount codes, scratch cards, and gift boxes that allow your customers to win their discounts in a more dynamic way. Additionally, you can add videos to your campaign, or custom HTML for more advanced users. 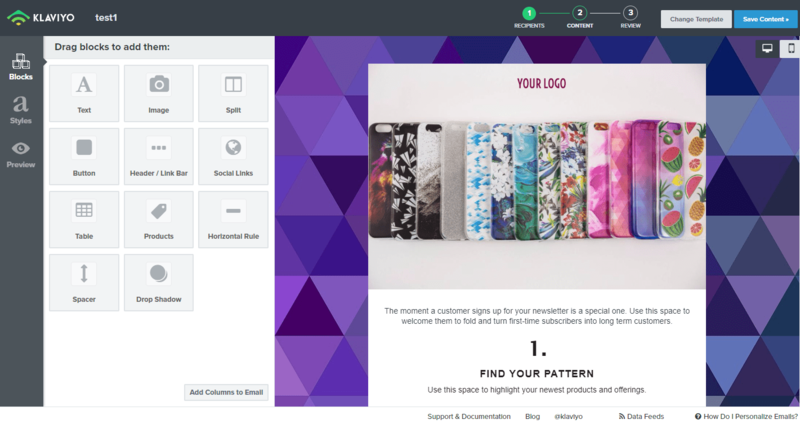 While Klaviyo’s email builder is nice, it’s ultimately missing some ecommerce features that will save online marketers a lot of time when creating campaigns. 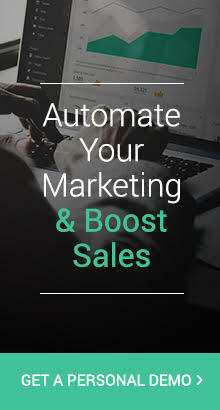 Anyone who knows anything about email marketing knows that list building is crucial to your strategy. After all, it doesn’t matter if you have gorgeous campaigns if there’s no one to see them. Both Omnisend and Klaviyo offer features that help you build your subscriber list organically from the visits on your site. Both offer embeddable forms and targeted popups to help you convert more visitors into subscribers. However, only Omnisend offers landing pages, which are proven to convert more than any other kind of sign up form. Also, Omnisend offers a gamified Wheel of Fortune sign up form that entices your customer to sign up to spin for their discount. Which Tool Offers the Best Segmentation and Targeting? Both Omnisend and Klaviyo offer targeting through segmentation to help you send the most relevant message to the right person at the right time. Klaviyo’s segmentation is rather robust. However, it’s worth mentioning that some of the language used in their segmentation definitions can be a bit confusing. These segments make a lot of sense in terms of ecommerce because you can layer them based on what you need. 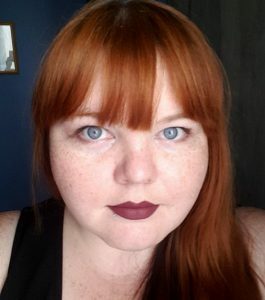 For example, using profile data to target women in their 30s, then campaign activity to select only women who have clicked on the last 2 campaigns, and then shopping behavior to select only those who have purchased in the last 6 months. With Klaviyo’s segmentation, the language is more basic, asking you to choose a definition based on “what someone has or hasn’t done” which could either be campaign related, shopping related, or something else. So this might be a bit confusing if you’re used to separating it a different way. Finally, both Omnisend and Klaviyo allow you to sync your segments into Facebook Custom Audiences for retargeting ads, but only Omnisend allows you to sync those contacts for Google retargeting ads. While both Omnisend and Klaviyo have been neck and neck up until this point, with small differences here and there in favor of Omnisend, things are about to change drastically. The biggest differences in these two tools can be seen in their automation workflows. Klaviyo certainly has a great visual workflow that is quite powerful. You can use conditional splits and trigger splits to create very complex workflows that are highly targeted to your subscribers. However, automation workflows are for email only. With Omnisend, you can create automated workflows that are just as powerful, and you can add in other channels to the same automated workflow. 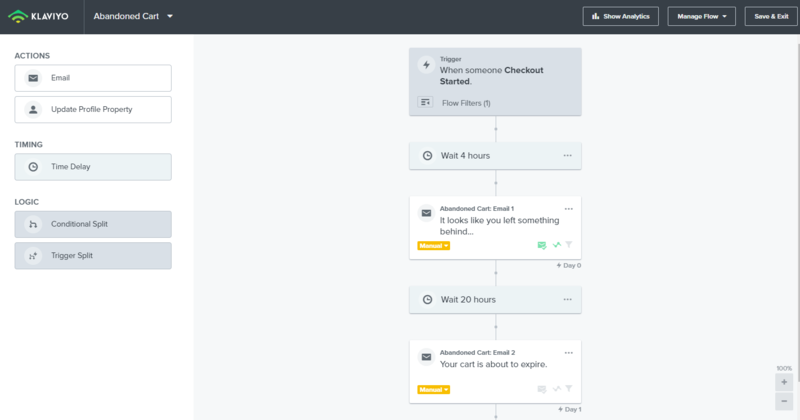 For example, you can start an abandoned cart workflow with SMS, follow up with an email, engage your customer the next day with a push notification discount, and then follow up with an email from there. When your customer does finalize their purchase, you can send order and shipping notifications via Facebook Messenger, WhatsApp, or Viber. All from one automated workflow. This means you can provide an omnichannel customer experience and offer your customers a choice in how they want to engage with your brand and on what channel. So while Klaviyo helps you send the right message to the right person at the right time, Omnisend takes it a step further, allowing you to send that message on the right channel. Which Tool Provides the Best Value for Price? Both Omnisend and Klaviyo have pricing based on the number of subscribers you have. However, Klaviyo only has one plan that’s offered, which tends to get pricey quickly as you add more subscribers. With Omnisend, there are two main plans for growing ecommerce merchants, with a Standard Plan starting at $16 per month and a Pro Plan starting at $199 per month. While the Standard plan offers most of the great email features Omnisend has, in order to take advantage of the omnichannel features, the Pro plan is your best bet. However, Omnisend’s Standard plan is completely customizable. You can add on modules as you go to personalize your plan for scaling easily with your business. This way, you only choose the features you need as you need them. Both tools tend to be on the pricier side compared to most ecommerce email marketing providers, however this only attests that both position themselves for established online sellers who need more sophisticated features. Winner: Depends on what you need and your subscriber count. Globally, a tie. When choosing something as critical as an email marketing provider, it’s important to do your homework and really test everything that the tool can offer your growing online store. Try out both tools and see how they really work. After all, not every tool will be right for every business. But hopefully, this in-depth comparison has given you some good points to work from. What are your favorite features from both tools? Let us know below!